​Tech Edge iPads in the classroom videos are informative and helpful videos that cover a wide range of subjects that pertain to educators. I watched episode 136 from which went over American Sign Language and talk to speech apps. It was hosted by Guy Trainin. This episode was very helpful it explained three apps, two went over American Sign Language and one covered text o speech. I really found this video review helpful, Guy answered all of the questions I could have had about these apps. He went over each app individually telling how it works and its main features. He also gave a brief tutorial on how to use them. I also really appreciated how he gave examples on how these could be used educationally. For example when he was going over the app that converts text to speech he talked about ways that it could be useful within the classroom, and how it is a great tool for students who have trouble communicating verbally. 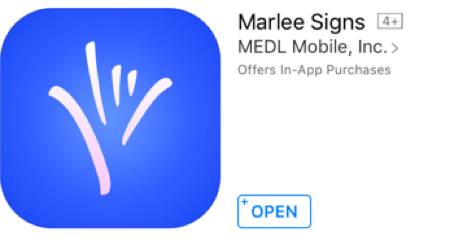 One of the apps about American Sign Language was Marlee Signs. This app goes over American Sign Language and was created by actress Marlee Matlin it can be downloaded in the App Store for free. This app includes a ton of helpful features. One of the features is called Spell, you can type any words there and it will spell it out to you in sign language. One really helpful thing about this feature is that it goes slowly enough you are able to practice the word while it is showing it to you. Another feature this app has is a lessons section. The app comes preloaded with one lesson called You. This lesson includes things like the alphabet, numbers, every day signs, and a lot more. More lessons that go in depth are available for purchase on the app.I really like this app it has a lot of resources that are really helpful especially when learning sign language or even just trying to communicate the basics with somebody who uses American Sign Language. This app would be great for any student learning American Sign Language. The text to speech app that Guy mentioned was called iSpeech – text to speech. This is a great free app to use in the classroom for any grade level student who has trouble verbally communicating. This app allows you to type in whatever you would like and it will convert it into speech. It’s really simple actually and you have the option to translate it to a different language. The app comes preloaded with English on it and you have the ability to purchase other languages. This is an app I could really see myself using within the classroom for students who have trouble communicating verbally. They could use this app and type out what they would like to say and have the app verbally communicate it. As a future special educator I will have students who have trouble communicating verbally and I think this would be a great tool to help them have more success with in the classroom.